The design of Winthrop’s new 970-student middle/high school is based on the community’s vision for a combined school that maintains separate identities. Shared core facilities including the gym, library, auditorium and black box theater comprise the space between two L-shaped academic wings that house the middle school and high school. This was my first experience with construction; maybe I should have been an engineer or architect instead of a nurse. Enjoyed every minute of the last 5 years. Classrooms are supplemented with project areas, providing the flexibility needed for 21st century teaching and learning where students are given opportunities to learn outside of the traditional classroom environment. These spaces can be used as pull-out space for individual support, interdepartmental planning or small group collaboration. 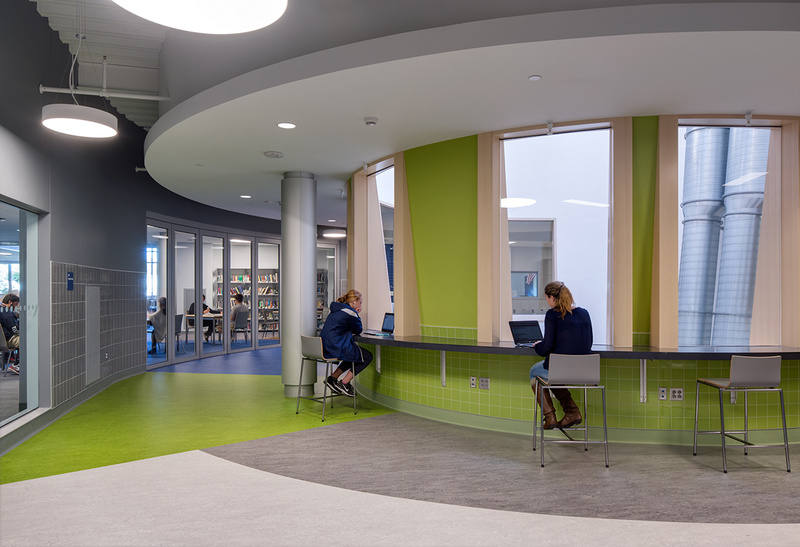 The new school is completely outfitted for 21st Century, hands-on learning to complement the STEAM-centered curriculum of the Middle School and the cross-curriculum team teaching at the High School level. Students now have an exciting variety of learning and social spaces, including expanded opportunities to experience science, technology and arts education outside of a traditional classroom. Specialized areas within the school include a STEM classroom and fab lab, which can host activities like Winthrop’s “Viking Longships” class, giving students the opportunity to explore Viking history through hands-on projects.